OIM default logo size is 119px X 40px (Width X height). If you change logo with height more than 40px height it won't fit into screen. To make it fit we need to change jspx file located in OIM ear. In this I am taking image of size 119px X 58px (Width X Height). 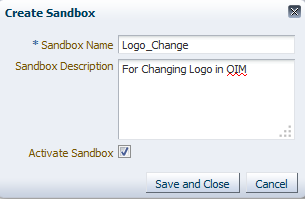 7) Select Oracle logo using mouse and click edit. 9) Provide details as shown below. 10) click close and it will get saved. 11) Publish Sandbox, these steps are enough if you are doing normal size image (119px X 40px) but for other size image follow remaining steps. 14) Change following line value from 30 to 64.
instead of value="30" and save 3 files and make it as ear and replace with old ear. I am following your steps above, but couldn't understand how did you managed to access your customized logo - http://localhost:14000/logo/mylogo.png ? 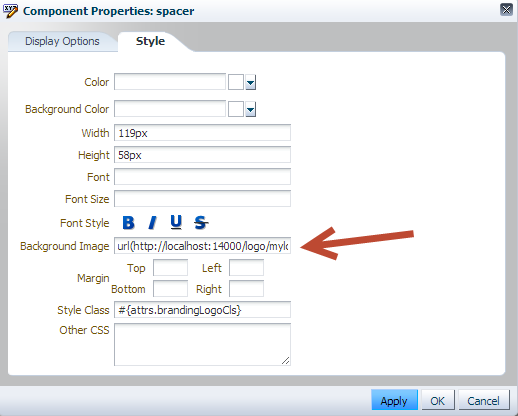 Because I am have my instance and not able to access any logos for example http://localhost:14000/logo/oracle.png But the oracle.png is in correct location. Your custom logo won't be there on server. You need to deploy your logo in any server and provide that URL. If you have weblogic you can make a war file with logo and deploy it on weblogic and access through that URL. I have created my custom logo and then created a war file and deployed it on OIM managed server and got the URL for that. Thanks for your reply Ravi. How ever, do you mind in explaining how to do this step that you suggested? Atleast point out to any document would be really helpful. You need to deploy your logo in any server and provide that URL. If you have weblogic you can make a war file with logo and deploy it on weblogic and access through that URL. its nothing about war file deployment, if you have any server just deploy the logo in any server even if it is webserver or appserver. Just you should be able to access that file through URL. first of all thank u so much for ur post and its too good. Signin page won't require any changes in files and you have different way of doing it . You can refer oracle documentation for that. Let me know if you are not able to find them, I will try put another post. 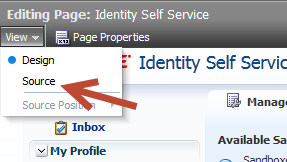 But the logo size is not changing in the sign in page.after logging in i can see the changes. but in the signin page the image is still in shrinked size. in this post i could see we need to make changes in three files u said, including signing.jspx. but im unable to find the header size in signin file. can u please provide me the link for oracle documenattion for that.as im unable to find it in oracle doc. In Home page if you go to custom and then source and scroll down then you will see tags for sign in page and some other unauthenticated pages. You need to right click on the parent tag and make it visible then only those links will get displayed. While trying to Integrate OIM with OID I got stuck. 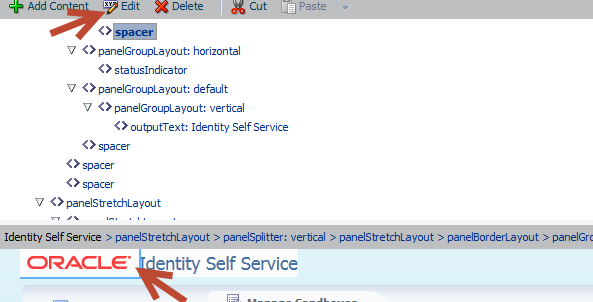 org.identityconnectors.framework.common.exceptions.ConfigurationException: Bundle oimjar://local:0ldapbp.jar is missing required attribute ‘ConnectorBundle-FrameworkVersion’. I 've done the Pre & Post installation task of the connector software (OID-11.1.1.6.0.zip) without any Issue. Here is the IT resource Details and Parameters that i configured. Connector Server Name <LEFT BLNK. the $OIM_ORACLE_HOME/server/ThirdParty directory AND run the PurgeCache.sh all without any issue. Could you tell what am missing here. i am not able to get the url format , can u show steps how to do that ? In which step you are trying to get URL format? Are you looking for creating URL for logo ? 1)You need to create a project in any IDE and place your image. but i have to reflect similar changes on Login page ? can you direct me to any docs or show me the steps .. thanks in advance. restarted the server , but did not see any changes , any advice from you is appreciated. I guess you are changing wrong files. See the exact path of file in 12th and 13th step.